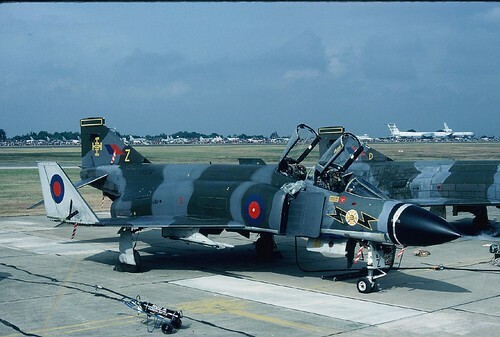 Greenham Common 1983 XV574 F4 Phantom RAF, originally uploaded by mike ward. F-4 and MiG-21 pilots. Using first-hand accounts wherever possible the author draws us into the dangerous world experienced by American and North Vietnamese pilots. Influential leaders and tacticians will be profiled to provide a comparative evaluation of their contrasting skills. This book will also reveal the technical specifications of each jet with an analysis of the weaponry, avionics and survival devices of the Phantom and MiG-21. The fighters' strengths and weaknesses will be compared also, including turn radius, performance at altitude, range and structural integrity. This was an intense and deadly duel between vastly different rivals. In the Phantom, a second crewmember and good radar compensated for the difficulty of providing command and control at long distances from the targets. However, the F-4's smoky engines and considerable bulk made it visible at much further distances than the small, clean MiG-21 and Phantoms were often hit by unseen MiG attacks. On the other hand, the F-4s eight-missile armament compared favorably with the two-missile provision of the MiG. Often pilot skill, if not luck, would be the determining factor between the smaller, faster MiG and bigger, better-gunned Phantom. First-person extracts will reflect on the dangers of these aerial duels while graphics based on records of engagement and technical manuals will illustrate the experience of air combat as they struggled to overcome their shortcomings and survive their deadly duels.